Read our helpful guide to second hand Mazda MX5. AA Cars works closely with thousands of UK used car dealers to bring you one of the largest selections of Mazda MX5 cars on the market. You can also browse Mazda dealers to find a second hand car close to you today. 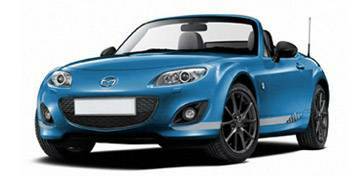 All used Mazda MX5 on the AA Cars website come with free 12 months breakdown cover. A sportscar which offers finesse, speed, excellent handling, style, and that is available under £20,000, the Mazda RX5 is the epitome of value for money. It should come as no surprise then, that it is also the world's most popular sportscar. The top performance option may sound meagre at just 2.0 litres, but its low weight means that it pulls away quickly and offers up a decent amount of speed, if not quite near the more impressive roadsters in its class. An affordable sportscar that is as fun to drive as many of its more powerful and more expensive competitors may sound like it is too good to be true, but the RX5 is proof that sometimes you can have your cake and eat it too.